Build your own football team and fight your way to the top of the league! Experience a unique blend between role-playing games and football! Recruit your team from over 1000 different characters, each with unique stats and personalities to build your team around. Topple the opposition with 200+ special moves to execute. Take your team into multiplayer matches and see how you stack up against your friends. 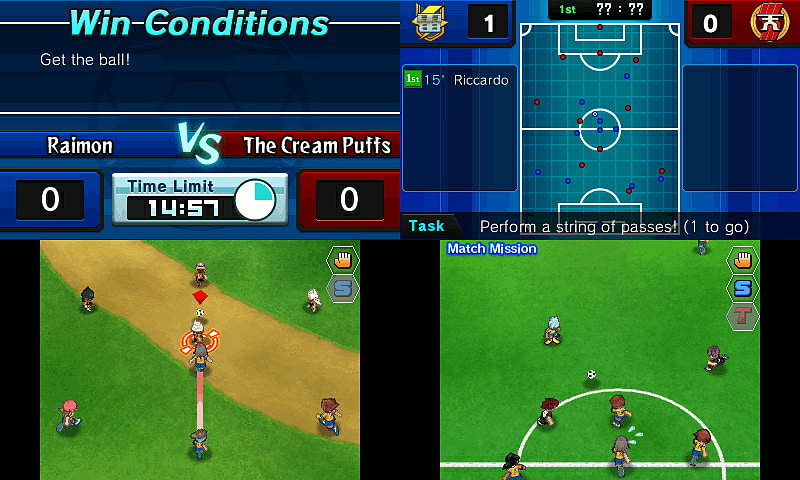 Inazuma Eleven Go is the fourth installment of the popular Inazuma Eleven series and the first part of the second trilogy. A role-playing game blended with football, players must scout and recruit characters, creating a truly personalised squad you can then battle with friends in multiplayer matches. As with previous Inazuma Eleven games, Inazuma Eleven Go will be released in multiple versions: Inazuma Eleven Go: Light and Inazuma Eleven Go: Shadow. Each version has its own aspects that make it unique like special attacks and special team. Get ready for kick off!